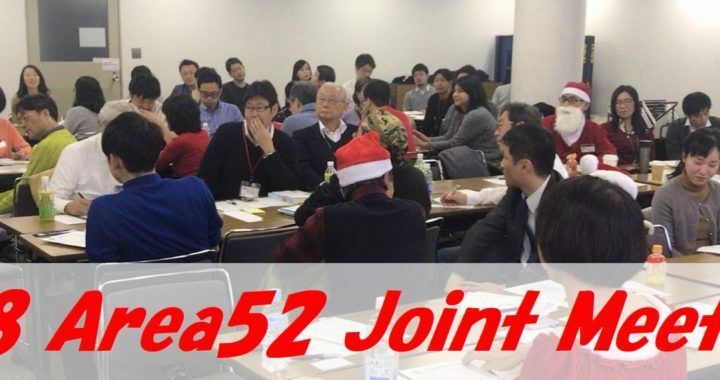 The Area 52 Joint Meeting 2018, a big event topping off the Heisei Period, was held in the Christmas season in 2018 at the Pio City in Sakuragi-cho, Yokohama. 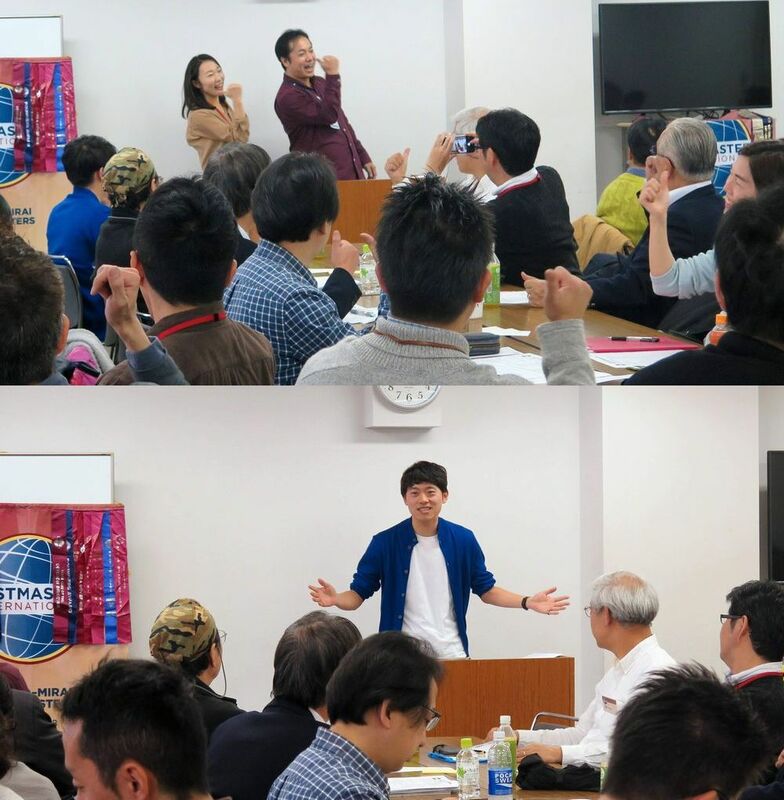 This event was hosted by the four Toastmasters Clubs in Area 52, which includes Yokohama, Minatomirai, Ocean and Kannai Toastmasters Clubs. Each president of the four clubs as well as other event committee members got together, planned and executed the splendid joint meeting that started with Konnyaku Exercise as an ice-breaker, followed by impromptu/prepared speech sessions, singing, dancing and more. The joint meeting was opened with the well-rehearsed, stand-up comedy-like opening remark made by the presidents of Yokohama and Ocean clubs. 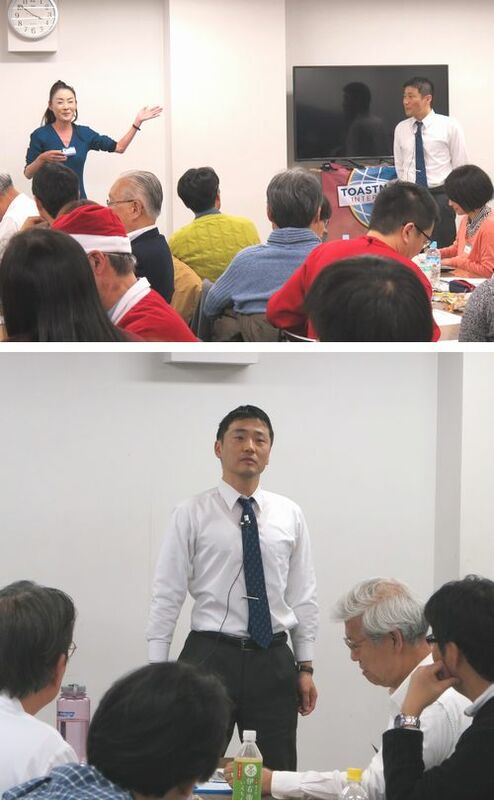 The first half of the meeting was facilitated by the TMOD (Toastmaster of the day) T, a VPE of Minatomirai Toastmasters Club whose fluent English fascinated the audience. 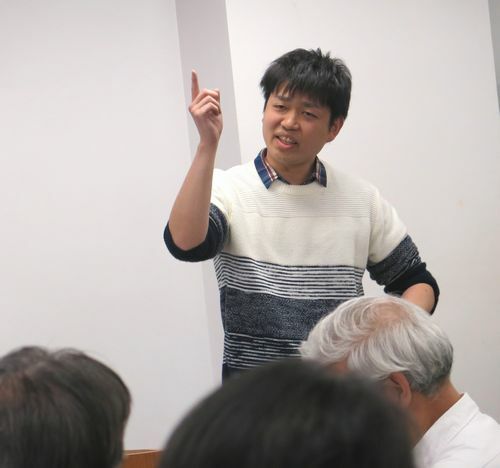 Since the meeting was co-hosted by a Japanese club, he deftly spoke in both English and Japanese. The first program on the agenda was the Ice Breaking Session, which was facilitated by TM K from Aoyama Lunch Toastmasters Club. She introduced us her secret “Konnyaku Exercise”, which had been passed on through generations in her family. The exercise was to sway and relax your body like a soft-bodied animal. She also introduced us how to break the ice when you meet someone for the first time, what to do when you forget the name of a person you’ve already met before and is standing in front of you now, etc. These how-to exercises were not only helpful in our daily life but also gave us a chance to get to know the people we met for the first time in this event. Next to the unique ice-breaking session came a Joke Session. 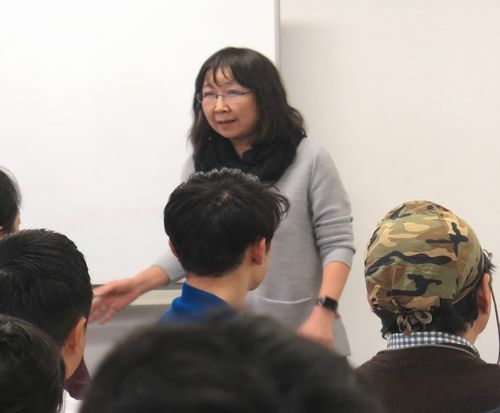 TM T, an experienced member of Minatomirai Club, cracked funny and witty jokes for the audience in fluent English and Japanese. The most impressive episode in his jokes was his original interpretation of the reason why the bells on the New Year’s Eve ring 108 times. According to his theory, 108 bells signify 4989 (Shiku-hakku: Shi=four Ku=sufferings and Ha=eight Ku=sufferings à tremendous struggles and sufferings), which can be calculated as (4×9)+(8×9)=36+72=108. His interpretation was that people strike a bell 108 times on the New Year’s Eve in the hope to put an end to all the sufferings of the past year and start a new year suffering-free. This was a WOW interpretation for me! The educational Joke Session was followed by the Table Topics Session, in which people try to improve their abilities in making impromptu speeches. The session was co-led by TM S from Yokohama Club and TM I from Ocean Club. It was interesting to see some speakers made speeches with confidence whereas some struggled a lot! After the short intermission, the latter part of the meeting started, which was facilitated by TM TS…me! In fact, I’d had no experience of emceeing the meeting in both languages and I was worried if I could do it well or not, but somehow I did it! The first program in the latter half was the prepared speech session, in which the total of four speakers (one speaker from each hosting club) participated. The first speaker was TM N from Yokohama club, who’s been working on the advanced manual, ‘Story Telling’. 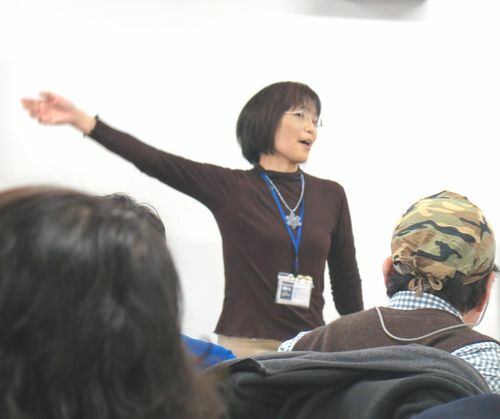 She talked about how to be successful in life from her life experiences. She finished her speech by singing “The Only Flower in the World” of SMAP and made us sing with her together, which was a brilliant idea. She later said she had downloaded the English lyrics of the song from the Internet. Since she is such a great speaker of English I thought she translated it herself! The second speaker was TM H from Kannai Club. Since Kannai Club is a Japanese club, I switched from English to Japanese here. Despite my worries, I could switch it without a hitch. It looks like I had underestimated my Japanese-speaking ability. His speech was titled, “I’m just an insignificant fellow”, which intrigued me a lot. His speech itself was truly interesting and made me reaffirm the power and charm of speeches in Japanese. Especially, his way of utilizing the visual aids, which was the main objective of his speech, was such an eye-opener. 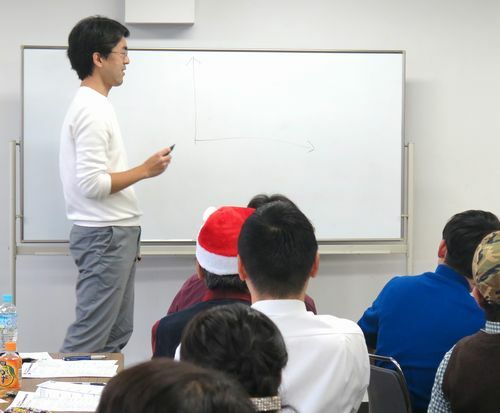 During his speech, he casually drew two lines on the whiteboard and said, “This, is the visual aid”. The audience laughed out loud in unison and shook the floor. 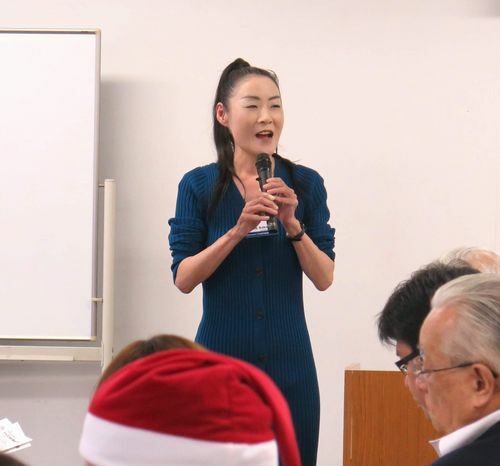 The third speaker, TM A from Minatomirai club, delivered a well-researched speech in her fluent English. She’d joined the Toastmasters just six months ago, but did a great job in telling us about the true cause of back pain based on the supporting data and her personal experiences with her husband who’d been suffering from chronic back pain. Back pain, for your information and according to her, is mainly caused by stress rather than functional disorders. I guess many people would be saved from sufferings by her speech. The last speaker was TM S.A. from Ocean Club, who delivered a speech titled “My Name”, which must have been inspired by the movie, “Your Name”. He spoke in his inherent loud voice, and his speech was ‘self-admiring speech’, which was opposite to the so-called ‘self-depreciating speech’. He admired himself a lot throughout the speech and made us laugh a lot. The prepared speech session was succeeded by the evaluation session. Although we usually have a general evaluator to facilitate this session, as we had a tight schedule I emceed the session as well. The first evaluator was TM W, who was a former president of Ocean Club, and she evaluated the TM N’s speech skillfully. The second evaluator was TM M from Minatomirai Club, who fascinated us with her witty and wonderful evaluation as well as her beautiful dancer-like pose. She explained that she was taking a ballroom dance lesson regularly. No wonder she could stand and move so gracefully. 論評が終わったところでいよいよ受賞者の発表です。発表は前半・後半TMODが共同で行いました。記念すべき合同例会で英語ベスト即興スピーチ賞を獲得したのは、サンタクロース姿で卓越した英語スピーチを披露したTM Oさん、日本語部門は稲荷ずしにまつわる恨み節を開陳したTM Tさんでした。ベスト論評者には、日本語論評に初挑戦したTM Mさん、ベストスピーカーには線2本でビジュアルエイドを表現したTM Hさんが選ばれました。みなさん、おめでとうございました! Following the evaluation session, we had an award presentation conducted by two TMODs. The Best Table Topics Speaker Award was given to TM O, who dressed up as Santa Clause for the occasion and entertained us with his splendid English speech. 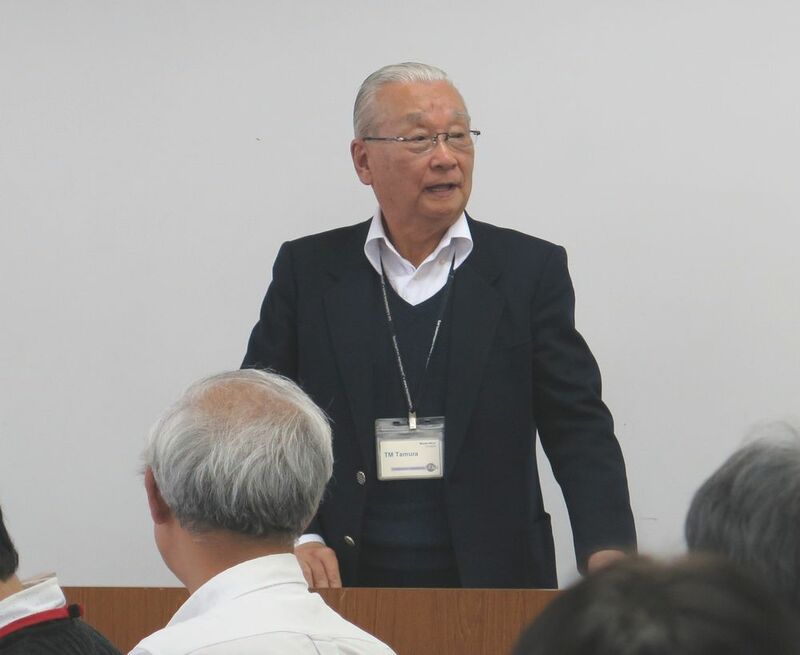 The Japanese Best Table Topics Speaker Award was presented to TM T, who talked about his grudge on his father who treated him Inari-sushi on Christmas Day in America. 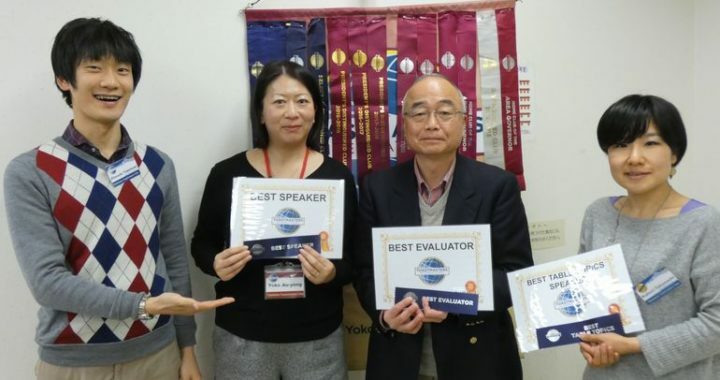 TM M, who made an evaluation for the first time in Japanese, received the Best Evaluator Award, and the Best Prepared Speaker Award was given to TM H, who used a visual aid humorously. Congratulations guys! The fun joint meeting ended with a special speech made by TM S, who is the Area 52 director and the 2nd place winner of the Division E Tall Tales Contest in 2017. He re-performed his legendary speech “Men’s Paradise” for this occasion. Some of the audience had never listened to this epic speech and we were all thoroughly entertained. Thank you very much TM S for your wonderful speech! Although the joint meeting was over, the night didn’t end here. It was followed by the Christmas Joint Party! The still-excited audience moved to the party venue where food and drink awaited the hungry and thirsty guests. But there was one more thing that awaited us. Some of the presidents and members, men and women, changed their outfits into school girls’ uniform and started to dance! Male members in girls’ uniform struck us speechless, momentarily, then we broke into laughter. The cosplaying dancers instructed us how to dance, and we danced together to the song of AKB 48. This proves how Toastmasters can rise to any occasion, doesn’t it? After the cosplay-dance performance, I noticed that they were assembling something big on the stage. I wondered what it was. It turned out to be a special make-shift stage for TM H, who performed Rakugo (Japanese traditional sit-down comedy) for us. He’s been taking lessons of Rakugo performance and he delivered one of the famous Rakugo classics, “Kin-mei-chiku”, wearing kimono with a Japanese fan in his hand. In this piece of Rakugo, a speaker has to do some long tongue twisters. While he was delivering it I tried hard to catch what he was saying. I believe any self-respecting Japanese would want to understand what’s being said. But no matter how I tried I could only pick up a few words in his long monologue. I was amazed to imagine how much efforts and time he dedicated just to memorize these words and speak them so fast. And he has to deliver it in a way to entertain his audience! Compared to this, making a speech in our regular meeting should be a piece of cake for him. That was what I thought. But according to him, it isn’t. When he makes a speech he has to create it from a scratch, so it’s as difficult as performing Rakugo. Anyway, his seriousness and dedication toward acquiring skills in both making speeches and performing Rakugo are truly impressive and I can’t wait to hear his new speech in our regular meeting soon. This joint meeting and party provided us with a valuable opportunity to meet other clubs’ members, interact with them, listen to their speeches and evaluations, dance and sing together, and more. Especially, I was glad to hear some of the new members say, “I didn’t know Toastmasters are so interesting and fun. A joint meeting is great, I want to join it again!” Wow, what a success. Let’s do it again fellow Toastmasters!